Xbox gamers will be pleased to know that Microsoft has this week announced the free Xbox games that will be available with Xbox Gold subscription memberships during April 2018. As always Microsoft is making available two free Xbox games for the Xbox One and two free Xbox games on the Xbox 360. But thanks to Backward Compatibility support Xbox One owners can enjoy playing both Xbox 360 titles as well. 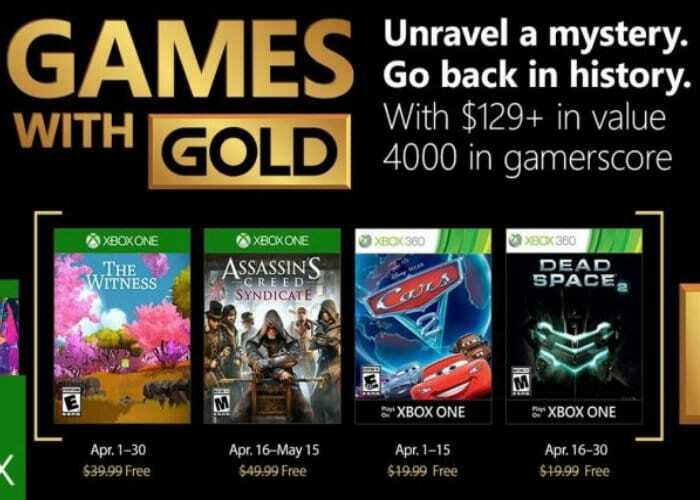 Next month during April 2018 On Xbox One, Xbox Live Gold members will be able to download The Witness normally priced at$39.99 ERP for free, together with Assassin’s Creed Syndicate normally priced at $49.99 from April 16th to May 15th. Xbox 360 owners will be able to enjoy Cars 2 The Video Game normally $19.99 for free from April 1st and from April 16th onwards Dead Space 2 normally $19.99 ERP)for free through until April 30th 2018.Check out the video below to learn more about what you can expect from each of the four games that are available for free to Xbox Gold members. Microsoft is also having success with their new Sea of Thieves pirate adventure game which offers an open world sandbox style game. During which you battle other pirates for treasures, with more than 2 million players joining the fun in the first few weeks since launch.